The Chad Valley DesignaFriend Emily Doll is extremely creative and loves taking pictures. She looks just the part in a cute blue top and matching pumps plus a dark skirt. Emily has soft flowing red hair, silky and luxurious to the touch while her malleable body makes her a doddle to get ready. The DesignaFriend charm bracelet is included too! 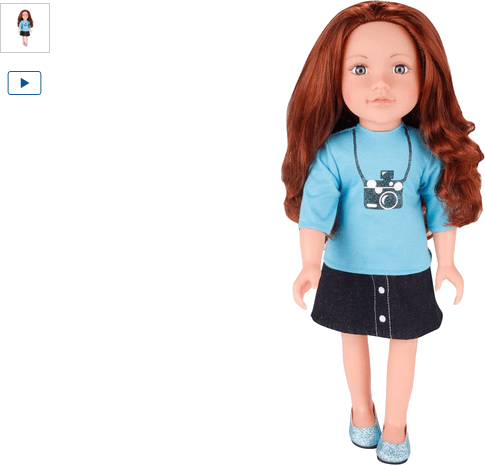 Get money off with April 2019 free Argos voucher codes, see if there's a promo code for the Chad Valley DesignaFriend Emily Doll product. Argos may be out of stock of this product. To enhance your shopping experience you may also be redirected to a search results page when you click an outbound link.